Shape sorters and puzzles are fantastic for developing the following skills: fine motor, problem solving, shape recognition, memory and coordination. And therefore have an important role in any pre school child’s play and learning. But wouldn’t you agree that most shape sorters/ puzzles for pre school children are pretty samey?! 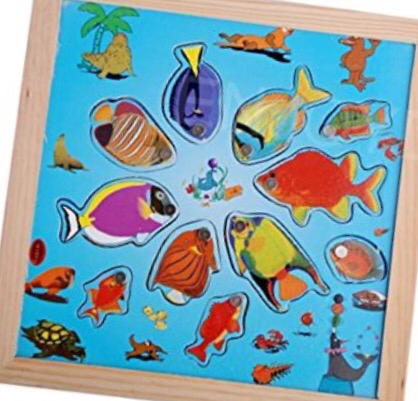 That’s why I love this Wooden Magnetic Fishing Game. There’s still a puzzle to be done, but it’s different. You get to use a pretend fishing rod and lift up the wooden (brightly coloured!) fish with the attached magnet to put them in the right shaped/sized space. You also get two fishing rods, so it encourages social play and competition.